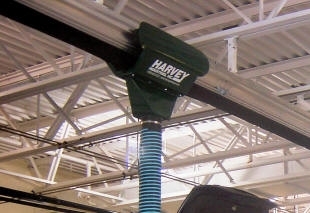 Harvey Suspended Systems are Ideal for retro-fits, the suspended systems are available from 3" Neoprene hose thru 6" Hi-temperature Silicon Fiberglass reinforced hose. Systems include hose, Adapter fitting to vehicle and adapter fitting to ductwork stub. 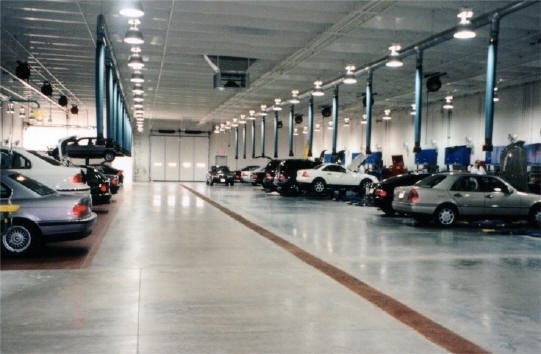 The Rail System has a smooth singular extruded aluminum rail traverses the shop providing mobility and quiet efficient exhaust extraction. 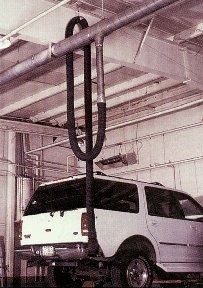 Bearing Mounted carriage moves to the point of need, eliminating the "jungle" of hanging hoses. Systems include hose, Adapter fitting to vehicle and rolling adapter, ductwork. This clean aesthetically pleasing design has been adopted by the shop designers as the ideal combination of functionality and clean appearance.